Posted on April 12, 2013 by Worth Stopping By . . .
Today we head uptown to Buckhead and its surrounding neighborhoods (note to self – never, ever attempt this at rush hour again!). 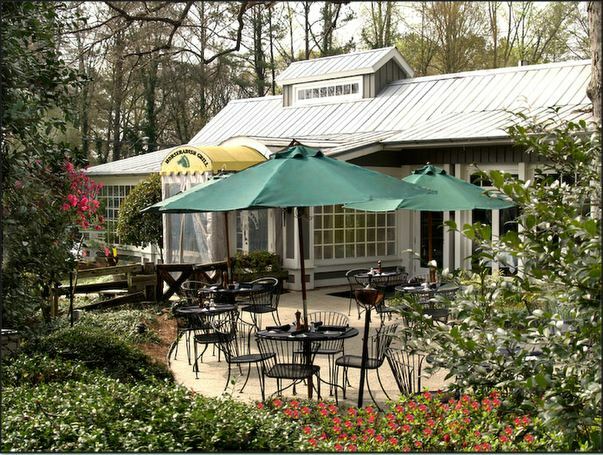 Ron and I are headed to Horseradish Grill, located on the very edge of Chastain Park, Atlanta’s largest city park. This neighborhood is absolutely charming — heavily wooded and filled with gracious homes and manicured lawns. Horseradish Grill was originally a general store located just off the old trail. Rebuilt as a horse barn in the 1930’s, Horseradish Grill currently occupies the space as Atlanta’s oldest continuously operating restaurant. It is beautifully rustic – featuring a pine ceiling with exposed rafters, expansive windows lining the walls of the main dining room, and a massive field stone fireplace. Glass doors lead you out to the patio area — surrounded by towering trees, shaded, intimate, inviting. The Horseradish Grill has an innovative menu that is based on the availability of local and seasonal items. Their dinner menu features such items as: Sweet Corn Crusted North Georgia Mountain Trout, Grilled Lamb Loin Chops, Venison Meatloaf, and Wood Grilled Duck Burger. Of course, each if finished with its own cream, jus, sauce, or aioli; and accompanied by specialized southern side dishes that range from Yukon Gold Scallion and Cheddar Smash Cake – to – Brown Butter Brussel Sprouts – to – Carolina Gold Rice with Antebellum Benne Seeds. We honestly had a difficult time ordering. Their menu has so many tempting options. With a little nod to La Lapin Saute, Ron ordered the Rabbit Pot Pie as an appetizer, and I had my favorite soup, a spicy Roasted Tomato Basil. The pot pie was served in a small ramekin (perhaps 3″), just enough to enjoy, but not fill up. Ready for the main event, Ron chose the Pan Sautéed Grouper and I chose . . . wait for it . . . chicken! I ordered the Oven Roasted North Georgia Airline Chicken Breast. The term Airline Breast was new to me. I was happy to learn that it is a boneless chicken breast with the drumette attached. I was much relieved – my experience with airline food has not been the best. However, the star of the show was a little bottle of Pinot Noir I like to call “Plump Jack.” No, actually, the name of it really is Plump Jack. It gave a big, juicy mouthful and a long, oaky finish. I now truly understand the meaning of the word unctuous. Needless to say our food was wonderful. Our meal was beautifully made, beautifully plated, and beautifully served. On that note, I cannot end until I give high praise to one of the employees at this restaurant. A kitchen employee, we first began to watch him shortly after we settled in. He was so fast and efficient. He made his way through the dining room with plates stacked, lining his arms, whizzing past like a pleasant breeze clearing and delivering plates as he went. At one point, we started counting the number of plates he could carry on one arm – we lost count at nine. I was so impressed that I had to stop to pass on my impressions to the owner. I was told that this young man and his father work alternating nights during the week, but worked together on the weekend. It seems that their tandem service is something to see. We enjoyed this restaurant thoroughly. The Horseradish Grill is very focused on customer experience. They provide valet car service, a full separate bar, maître d’, and a well staffed dining room and kitchen. Posted on April 22, 2012 by Worth Stopping By . . .
I’m not sure why I have been thinking about this restaurant so much. As you enter, you are surrounded by a swirl of deep rich colors and soft, plush decor. It is, in a word, decadent. The ceiling has disappeared under a drape of gold and maroon fabric that cascades down the walls. The seating is low to the floor — soft couches and upholstered Moroccan stools. We were intrigued by all aspects of this place. My mother-in-law, Rachel, ordered something with rice or potatoes. Ron ordered something exotic . I ordered Chicken and Caramelized Apricots (surprise!). The food was fantastic. The vegetables were fresh, the lamb and chicken tender, and everything was seasoned with some of my favorite spices — saffron, cumin, and paprika. However, my favorite menu item was the ‘Festival of Moroccan Salads’. A festival!! Now, for the entertainment portion of the evening. We were graced by the presence of a palm reader. I remember her long, flowing skirt and large jewelry, but most of all, her dark, dark eyes. Every inch a ’gypsy’. She sat at our little table and told us tales of the future. I don’t remember too many of our soothsayers predictions, but she did say that Rachel would meet a love interest that lived very close by in the near future. I think we all agreed that was not going to happen. Lots of fun. 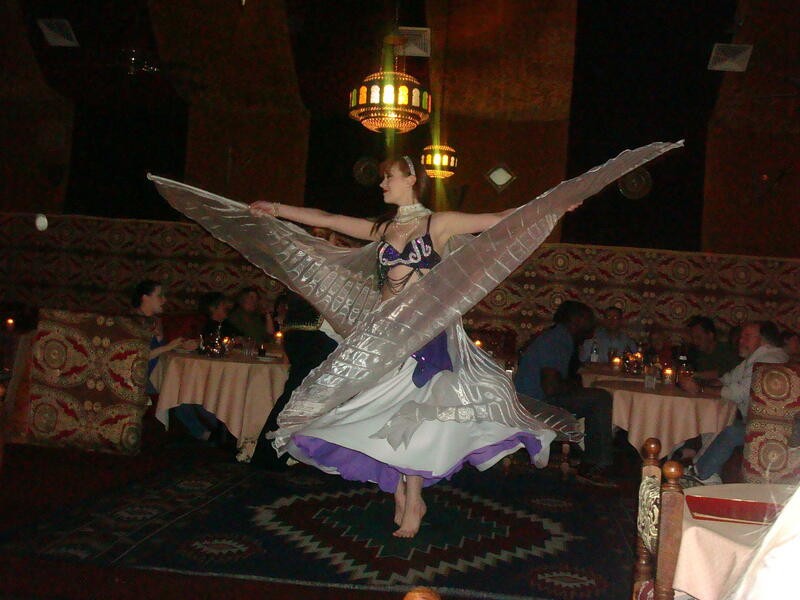 I must say that the belly dancers were the highlight of the evening. Beautiful women moving rhythmically to the sound of drums, flutes, and tambourines. Such lovely bedlah costumes — sculpted beadwork and intricate overlays, diaphanous chiffon skirts and veils, fringed hip scarves covered with paillettes. There were flashes of sequins everywhere – on their hands, in their hair, at their necks, on their feet. A beautiful and surprisingly athletic form of self-expression. We had a wonderful time and thoroughly enjoyed the whole experience. Definitely worth stopping by . . .